AB de Villiers (South Africa), Steve Smith (Australia), Chris Lynn (Australia), Brendon McCullum (New Zealand), Colin Munro (New Zealand), Luke Ronchi (Australia/New Zealand), Dwayne Bravo (West Indies), Sunil Narine (West Indies), Kieron Pollard (West Indies), Imran Tahir (South Africa), Colin Ingram (South Africa), Mitchell McClenaghan (New Zealand), Thisara Perera (Sri Lanka) and Rashid Khan (Afghanistan) are confirmed to be part of the draft for the next yearâ€™s edition. 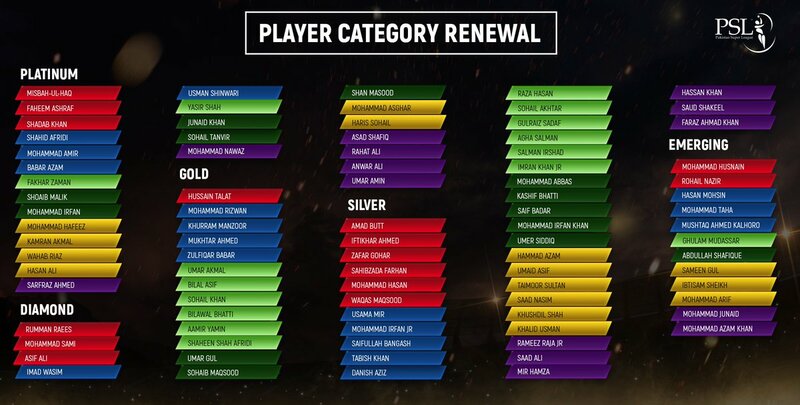 (10-04-2018, 07:50 PM) Fakharzaman Wrote: Fourteen International Players have been placed in the topmost category of PSL, a Platinum category, for the fourth edition of the Pakistan Super League. Good to hear that. AB de Villiers is a huge addition to PSL. Won't come cheap though! Watch today’s cricket match on Pakistan’s most watched sports tv channel, PTV Sports Live streaming. Also, Watch Pakistan vs South Africa 2019 T20, ODI, and Test Match Live Streaming on PTV sports youtube PTV Sports Live PSL . Pakistan vs Australia 2019 and Pakistan vs England series 2019 exclusively on PTV Sports. Moreover, all matches of PSL 2019 and ICC Cricket World Cup 2019 are also available live here on PTV Sport live streaming online and on Ptv Sports tv channel. Watch live cricket online on PTV Sports.